Order a surgical stent with your immediate denture and get a free up grade to our Surgical AED (limit two to a practice)…But you have to ask for our Web Wewards. These will double as a surgical stent and as an Avoid Embarrassment Denture when it’s time for the definitive lab reline. 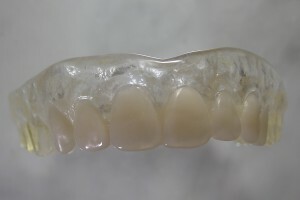 Made with clear ortho material with the anterior six in a tooth resin.